1.Forwards line up in the neutral zone on one side and D on the other on their offensive side of the red line. 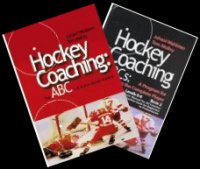 2.Start with a 1-1 and the supporting players join the play when the puck enters the zone and play 2-2. 3.This is a game and not a drill, so no whistles. Original players leave when the puck is carried over the blue line and there is a 1-1 the other way with the players who supported. 4.If the puck is dumped out the players stay on and regroup. 5.Situations up to a 3-2 each way can be practiced with this flow.